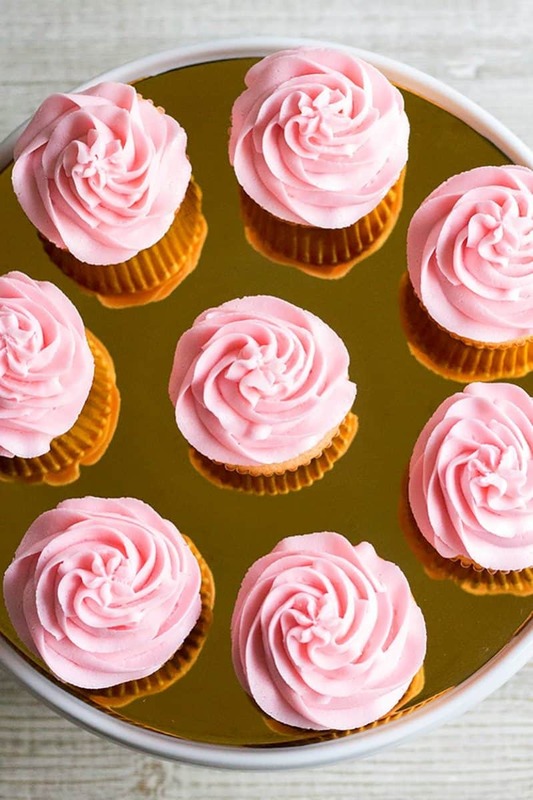 Pink Asti Cupcakes are a sweet treat that’s perfect for celebrating Valentine’s Day, bridal showers, or Mother’s Day! They are deliciously hard to resist! I love champagne!! It’s so bubbly and delightful. It’s my favorite thing at any wedding, apart from the newlyweds. I adore sparkling wine too, like a good Asti or prosecco. So what’s the difference? Only champagne from Champagne, France is champagne. Everything else is sparkling wine. Even if you’re at the store and see “méthode champenoise” on the label, if it’s not french it’s sparkling wine. As much as I like champagne, a good Asti has a special place in my heart too. While I don’t normally gravitate towards sweet wines, Asti has this subtly sweet flavor profile that I adore. My favorite these days is Martini & Rossi. 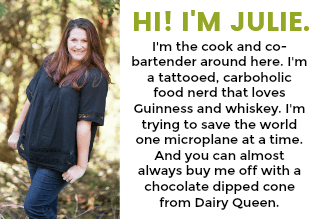 Since Valentine’s Day is perfect for a good glass of champagne, I figured why not sneak a little into dessert too! 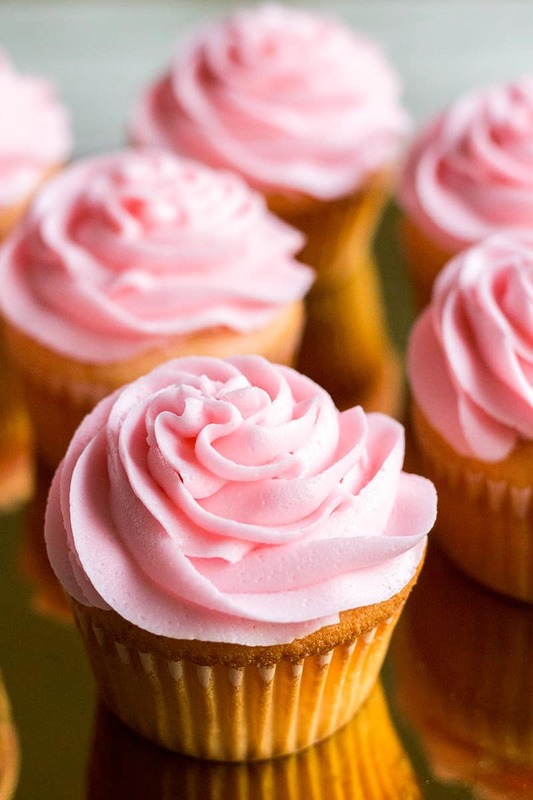 These Pink Asti Cupcakes are SO good you guys. The Asti in the cake gives the outside edges a caramelized sugar taste and the frosting is just bursting with Asti flavor enveloped in a luscious buttercream texture. Are you drooling yet? You should be. If you need a showstopping dessert for your next girl’s night, this cupcake moscato d asti is it! 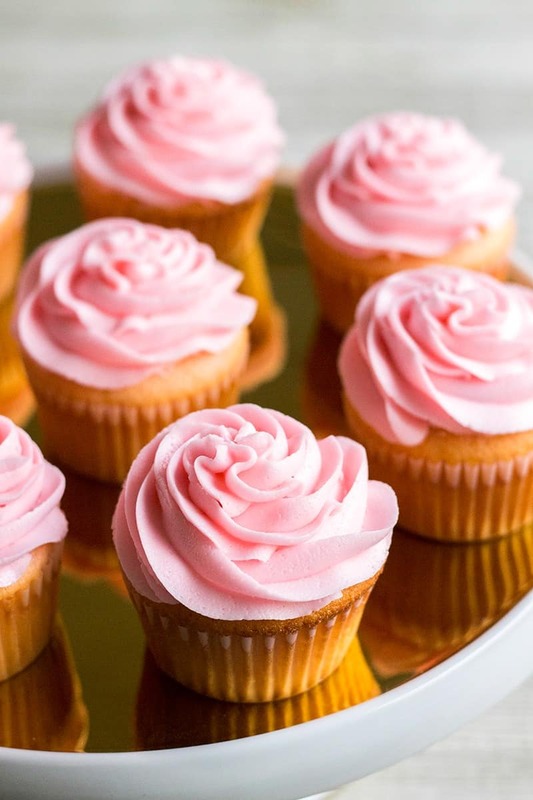 Pink Asti Cupcakes are a sweet treat that's perfect for celebrating Valentine's Day, bridal showers, or Mother's Day! They are deliciously hard to resist! Preheat oven to 350 degrees F. Place cupcake liners in each cup of a muffin tin. In a large mixing bowl, beat together the butter and sugar for 1 to 2 minutes or until light and fluffy. Add 1/3 of the flour mixture to the wet ingredients, and mix until just combined. Add 1/2 of the Asti to the wet ingredients and mix until combined. Repeat with the remaining dry ingredients and Asti, mixing until just combined. Add the food coloring and mix. Add food coloring and mix. Add more food coloring if desired until your preferred shade of pink is achieved. Portion the batter into the prepared muffin tin, filling each cup about 2/3 full. Bake for 20-22 minutes, or until a toothpick inserted into the center come out clean. Carefully remove from the oven and allow cupcakes to cool for 5 minutes in the pan, and then remove to wire racks to cool completely. In a large mixing bowl, beat the butter for a for 1 to 2 minutes until fluffy. Add 1 cup of powdered sugar to the butter. Beat until combined. Repeat two more times, for a total of 3 cups of sugar. Add the salt, vanilla, Asti, and food coloring (add more food coloring if you like to achieve the color you want) to the frosting and beat until combined. If the frosting seems stiff, add 1/2 tablespoon of Asti at a time, mixing after each addition, until your desired consistency is reached. If the frosting isn't stiff enough, add more powdered sugar, a couple tablespoons at a time, until your desired consistency is reached. Once cupcakes are cooled completely, frost them with the buttercream. Add sprinkles, cupcake picks, or leave your cupcakes just as they are…simple and lovely.